For many weeks already, there’s been a vibrant discussion about the rice that we eat here in Thailand. As someone who is a very fussy eater - I love knowing where my rice is grown, and don’t eat rice that’s too hard, too old, too crumbly, or too pungent. But I don’t mind if my rice is crawling with a few ants or weevils – and as I work with people who know a few things about growing and harvesting rice, I’ve compiled some basic information about the rice that we eat. How does our rice make its way from the field to the fork? I hope this will help others who eat rice to make some calm and considered choices, and not become unduly anxious. If we begin with paddy rice, we can divide this into two major types. That is the Khaaw Na Pi (Wet season rice) and the Khaaw Na Prang (Dry season rice). Khaaw Na Pi is planted around now actually, in July and it is harvested in November or December. For the wet season, two varieties of aromatic rice are popular (khaaw hom mali) - jasmine rice and RD 15 * (an irradiated jasmine rice variety). There are also traditional rice varieties such as Lueang Pathiw, Khaaw Tahaeng, Sankhyod, Phitsanuloke 1, Niaow Ubol, Niaow Sanpatong, Jekcheuy 1, etc. Rice varieties grown in the rainy season are photosensitive. The dry season varieties of rice are harvested in May – August and are photo period insensitive. The aromatic varieties which tend to be planted in the dry season are Hom Pathum, or Pathumthani 1, and various hybrids from the Rice Department and different Rice Research Stations eg in Chainat and Suphanburi provinces. The upper numbers of the RD varieties such as RD 31,37,39,41,47,49,51 etc. tend to produce fairly hard grains, the majority of which are exported. Many Thais like to eat rice that is aromatic and fluffy, however there are others who like to eat firmer grains, of which there are some traditional varieties and some newly developed varieties. These days, it’s quite hard to find traditional varieties of rice on sale. Traders that claim to offer KhaawTahaeng, for example, may in fact be selling you newly developed varieties. Now let’s look at the process of paddy rice farming... and please excuse this highly condensed account… These days, rice is mostly planted by manual seed scattering. Some farmers hire planting machinery, but the costs are high and prohibitive for a lot of rice farmers. Before planting, the weeds on the rice bunds are killed with Glyphosate and then the soil is prepared, the fields are ploughed, and stirred. The rice seeds are soaked for one night so that they sprout. On average, farmers scatter around 25-30 kg of seed per rai [or 150-190 kg per hectare]. One week later, they apply a chemical weedkiller such as Propanil or Butachlor (known as wet control) or the weeds will grow faster than the rice. Mostly, when they spray herbicides, farmers mix these with pesticides such as Abamectin, Chlorpyrifos, or Cypermethrin. Around 4-5 days later, farmers will check if these have worked and if not, they will apply another mix of chemicals (called dry control). After that, the field is flooded, and the weeds begin to die off. Once the rice seedlings begin to grow a little, pests such as rice whorl maggots have to be managed. As soon as the plant develops a bunch of shoots, stem borers, rice gall midges, planthoppers, start to arrive and these have to be monitored and sprayed if necessary. If your neighbouring plot is infested, and your neighbour is spraying pesticides, then insects will simply move onto your field if you do not spray it too. Throughout the production cycle, fertilizer is applied 2-3 times, around about Day 25 and Day 60. Mostly when the fertilizer is applied, Carbofuran (pesticide) is also mixed in and spread around. Two or three days later, more pesticides are sprayed because the rice will start to look green and delicious to the pests. Once the rice is fertilized, the plant is nurtured with hormones. Overall, the number of times on which pesticides are sprayed to ward off insects and crop diseases depends on how many epidemics the paddy field faces. If you want to know what exactly is being sprayed, there are around 300 brands, too many to mention. But, we can categorize them as around 20 types of chemicals to limit weeds, pests and crop diseases. For more details please see Thai PAN’s website [http://www.thaipan.org]. Once the rice is around 95-120 days old, it is ready to harvest. It all depends on the rice variety. Photo-sensitive varieties need longer to mature, even over 120 days. Photo period-insensitive varieties can be harvested earlier. These days, the later RD varieties can mature at around a mere 70 days, which are well suited to situations when there is a sudden flood. These days, almost all farmers harvest their crop with a machine which pulls up the rice up onto a truck ready to be taken immediately to the nearest threshing mill or trading post. Rice planted in wet season but harvested in the dry season will have fewer humidity problems than dry season rice, which is mostly harvested in the rainy season, which can have up to 20-25% moisture content. So let’s turn now to the post-harvest, and here is where we get to the millers, the warehouses, and the central warehouses rented by the Public Warehouse Organisation. When storing rice, it’s best to keep the husk on. 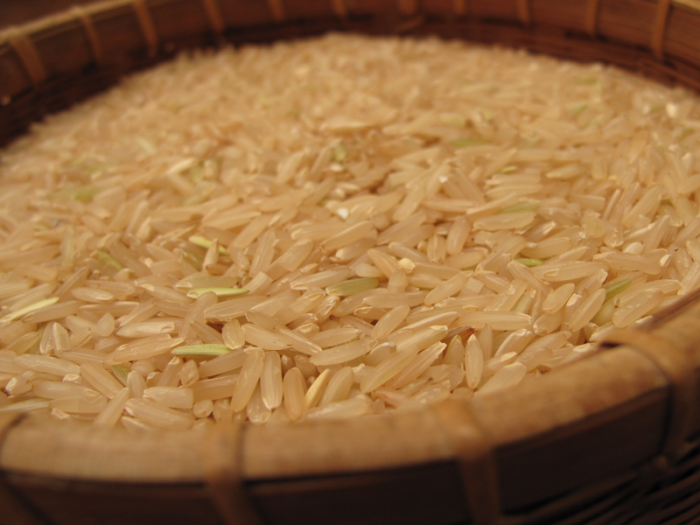 Rice can be kept for a long time and is slow to lose its quality. In the past, when the millers bought rice, they mostly stored it as unmilled rice. They would only mill rice in batches, according to sales orders. 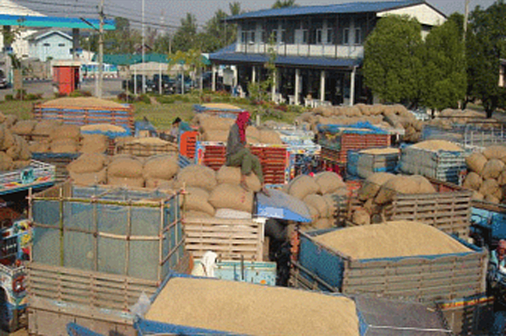 Rice has to be kept in conditions of maximum 14-15% humidity. Therefore from the guaranteed price of 15,000 baht per tonne (under the Rice Pledging Scheme), millers tend to subtract a percentage based on rate of humidity in the rice they buy, which means that the rice farmers themselves receive around 10,000-13,000 baht per tonne. The rice millers have to recover the costs of drying the rice for storage or milling, - you cannot mill rice while it is moist. It has to be dried so as to leave only 14-15% humidity, otherwise the rice grains are liable to break resulting in high losses. Stored rice also has its pests. Whether its unmilled or milled rice, rice weevil eggs were laid while the rice was still in the field. There are many different kinds of weevils, different bugs, rice moths, and there are also mice too. These are controlled through fumigation, and as we now know, mostly two types of gas are applied, Methyl Bromide and Phosphine. Used in the right way, these gases are not dangerous, and do not leave persistent residues. The Public Warehouse Organization (Ministry of Commerce) stipulates that stored rice should be fumigated at least once every 2 months to protect against losses of rice in the warehouses. Unofficial reports from field however, indicate that mostly these gases are used around every 15 days or whenever an infestation occurs. As I said earlier, these two gases do not usually leave residues. Although in the case of Methyl Bromide, the international community have made a commitment to stop using these in the near future, as it is a gas that destroys the ozone layer. Whether there are other chemicals which can be used apart from these two is also something we would like to investigate. We’ll have to wait for the evidence on that. I can tell you that the rice accepted by the State’s Rice Pledging Scheme over the last 2-3 years is stored as milled rice. In other words the mill tests the quality of the rice, measures the humidity of the grains, and the weight before it buys the unmilled rice. A local Working Group issues an invoice for the farmers to claim money from the government. The millers proceed to mill the rice, if it is white rice, they are contractually obliged to submit 470 kgs of good quality grains per tonne of unmilled rice. In the case of aromatic rice, they are obliged to submit 410 kg of good quality grains for every tonne of unmilled rice. These are traded to central warehouses rented by the RTB to store the rice. However, millers also profit from the cost of milling, the value of the broken rice, the rice husks and the price of whole grains that are not transported to the central warehouses. If the rice is good, they will get a high number of good quality grains. Or if not, they can push down the prices they offer to the rice farmers. If they have warehouses for rent, then they can get rental income from these per tonne of milled rice stored in them. The Deputy Director of the Public Warehouse Organization (PWO) has said that around 17-18 million tonnes of government stocks of milled rice are managed by the PWO. Of which, around 2.3 million tonnes of rice is from the 2011/2012 Rice Pledging Scheme, around 7.2 million tonnes is from the 2012 Rice Pledging Scheme, and 8 million tonnes is from the 2012/2013 Rice Pledging Scheme . So the question is, where exactly does the rice that we eat every day come from as the majority of the rice is still in the warehouses rented by the government. We went to check the Office of Agricultural Economics production figures for unmilled white rice and unmilled aromatic rice varieties. In 2011, 29 million tonnes of unmilled rice was produced. In 2012, another almost 31 million tonnes was produced, which after milling reduced in weight by around a half. Thus 15 million tonnes of milled rice were produced in 2011 and 16 million tonnes in 2012. In Thailand, we consume around 8-10 million tonnes of rice every year. Approximately 10.8 million tonnes of rice was exported (adding together white rice, Hom Pathum, and jasmine rice) in 2011, and 7 million tonnes in 2012. These figures are too simplistic, but to give you more detailed figures we would need to separate out monthly rice yields, to distinguish wet season and dry season rice, which takes time. But these round figures can at least tell us that when you subtract the amount consumed within the country and the amount exported each year from the amounts produced, there is no surplus. So why are the stocks still so high? It becomes even more confusing when you can see that there is plenty of rice left in the silos, so where does the rice that we eat come from? Our first assumption is that there must be some covert selling, recycling the rice in and out of the rice pledging scheme including importing rice from other countries to mill and sell here, or taking advantage of quotas. And this is not happening in small numbers. Now we need to talk about rotten rice. Rice that has lost its quality, rice that is fumigated with poisonous chemicals, how does this happen? As we mentioned earlier, when we store rice, its best if it’s stored unmilled. After the husk is taken off, in the milling process, the rice is referred to as khaaw sarn, it begins to absorb humidity, and is more difficult to store. And if the weevils and other insects come to eat it, more and more flour is created which absorbs more moisture and the rice becomes rotten more easily. When rice is rotten, it starts to fuse together and turns a yellow colour. Rotten rice is easily visible to the eye. The rice trading companies are unlikely to slip up and let this be packaged into bags for sale. It would be far too visible. If on the other hand, they allow this to be mixed in with rice donations to victims of disaster for example, this would be a double misfortune for those waiting in line. Another form of rotten rice is when humid rice grows mould, this type of aflatoxin is dangerous. If it builds up, it can be carcinogenic. This is also visible to the naked eye and is similar to rotten rice in that the rice forms a mass, turns a dark colour and begins to smell. So far in the news there have been no serious reports of anyone buying packaged rice and finding rotten rice. But another story is rice that slowly deteriorates. When rice is kept for long periods of time, its quality changes over time. Stored for over a year it starts to lose its quality. As it absorbs moisture it starts to crumble, break, harden and lose its aroma. It’s no longer tasty. Sometimes it may be musty and have a smell, but that doesn’t mean it’s rotten. This can happen even if it is kept in Grade A silos and warehouses which invest a lot of money to ensure they are well ventilated and temperature-controlled. If you think the rented warehouses will invest the same, you may be expecting little too much. Concerning rice that has been fumigated, the government officials have come out to insist that the two chemicals or gases which the government recommends both evaporate quickly and leave very few, if any, residues. The Agricultural Science Department has issued the following figures. Methyl Bromide can be used to fumigate rice at the rate of 32 g per 1 cu.m or around 50 grammes per tonne of milled rice. The period of fumigation is 24 hours and it will evaporate completely as soon as the plastic cover is opened. These chemicals are favoured because they are lighter than the air, so they will evaporate upwards. They are able to enter into the gaps between the rice grains, and it is cheaper than other types of chemicals. In the case of Phosphine, these are small granules which act like small mothballs, evaporating downwards. To fumigate milled rice, phosphine is used at the rate of 2-3 granules per tonne of rice (each granule is around 3 grammes) or a dose of Phosphine 9-10 grammes per tonne of milled rice. The fumigation takes place over 5-7 days. After it has been fumigated, it takes another 12 hours afterwards for the gas to be fully expelled. As this method takes more time than the Methyl Bromide, it tends to be used less. These chemicals can kill if they are inhaled directly. Therefore these chemicals are most dangerous at the fumigation stage. Birds, mice, cats, any animals that somehow get into the area when rice is being fumigated will die instantly. Thai PAN (Pesticide Alert Network) has found two studies from the US National Institute for Health which has found that those who work in direct contact with Methyl Bromide are at higher risk of stomach cancer than those who have not had such contact. Let’s repeat that, this finding only applies to those in direct contact with the chemical, not those who consume any residues. If we store rice for long periods of time, then it must be fumigated more and more times. So then it is possible that the risks are increasing. But what is more likely is the increase in residues in the ecosystem and environment. This is because these gases after they evaporate then mix together with moisture in the air and can fall as rain back onto the surface of the planet, which over the long term can increase the resistance of pests. Which will mean that we will have to find new ways to manage pests which may hold more risks than the current method. 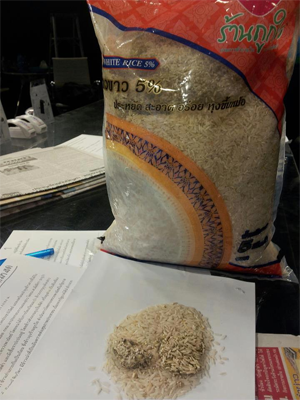 As soon as there was a rumour of “danger rice”, the Medical Science Department of the Food and Drug Agency collected 57 samples of rice from the market to investigate in the chemical residue labs, which found that there was residues in 26 samples at the level of 0.9 -21 ppm (parts per million or mg/kg), which is not higher than the applicable Thai standard maximum limit of 50 ppm. In other words, this is a relief. Amongst those which were studied, there was no danger according to the standards used by Thai, Japan and the United States. However there are some concerns. Other countries have issued a maximum residue level (MRL) at much lower levels. For example, India has set the level at 25 ppm, China at 5 ppm, and Taiwan has set the MRL at a mere 1ppm. In this case, there could be an impact on our exports over the long term. At the same time, the Foundation for Consumers with the Thai PAN network collected its own samples. This has been a supplementary test, and the results are likely to be out next week. Whatever the results, it is good that people are becoming alert to this issue. It means that the relevant government departments must do their job assiduously and we can hope that the testing will be done regularly and continuously to build the confidence of the consumers. And it would be very good if the government could speed up the release of rice stocks before they get any worse or become rotten, and since they have to keep being fumigated. I guess that’s enough for now. I hope that this can help spark your curiosity to look up more information regularly and hope that the rice situation will promote a higher quality of consumers alertness. That is, I hope people will be encouraged to study and investigate the facts and information comprehensively, and help to develop a consumer movement which monitors and investigates the obligation of government agencies’ to give us genuine guarantees of safety.